The starting point had been my desire to paint the Olympic clock in Trafalgar Square; this ultimately became painting 28 “Time for the Olympics”. I thought it would be good to do a companion piece as I had an identical canvas, and one can enter two paintings in each Eagle gallery exhibition so I thought these two pictures would work well as a pair. 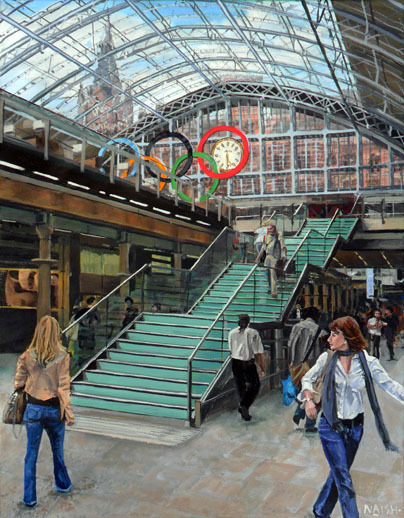 On walking through St. Pancras railway station, I realised the Olympic logo naturally framed the station clock. So I retraced my steps and took a quick snap that became the basis for this new painting. “Time for the Olympics 2” was born. This might suggest a negative connotation of the games with people apparently bustling about with no time to take interest in the games. There was of course fear at this time that the games would be an expensive disaster. The photo captured the framing aspect I required but there was not enough interest in the foreground. I had taken photos of some people around the gay pride march that was proceeding around town on the same day; so I used these to introduce the two foreground ladies. I got to a point where everything was in place, but my time ran out to exhibit them together. The piece was shelved for some months as other projects took precedence. Returning to the project in 2013, I felt a need to get it finished and out of the way. It felt a little out of time as the Olympics had passed successfully and warmer ones had replaced people’s previous negative feelings for the games. People’s ambivalence towards the games seemed to evaporate that summer, and I wonder if the subtext illustrated in these pictures would even be accepted as ever having existed. The title “Time for the Olympics 2” was set to evaporate too. I found contextualising the skin tones of the lady on the right quite hard, as the reflected light from all the shop fronts made for some quite interesting shadows on people’s faces. So, one Sunday, my wife and I went up to St. Pancras for a photo shoot. It was quite a shock to discover the hotel clock tower seen through the glass ceiling had been completely omitted on my version so far. Having used a photo where the sky had bled out to white, I had added some blue and clouds but had not realised that I was missing a bit of building. This was tricky to photograph as the sky would wash out the detail. I even took some shots outside the building at the opposite side of the clock tower to achieve better reference. I also took photos of my wife to see how the shadows on the floor surface worked. All in all a useful day, far beyond the use I thought it would be. The moral of the story is to have good reference.